The US101 offered by Lockheed Martin, AgustaWestland and Bell could fulfill requirements for a new U.S. presidential helicopter at lower costs and less risk than the VH-92 proposed by Sikorsky and its partners, top Navy officials decided. It wasn't the flag, it wasn't the systems---it was the aircraft. And at a Jan. 28 Pentagon briefing on selection of the next U.S. presidential helicopter, Navy executives stressed an urgent need for that aircraft. The Navy's selection of a Lockheed Martin-led team was based on who could produce the fastest what will amount to a new aircraft. The aircraft to be fielded by October 2009 will be based on AgustaWestland's EH101 instead of Sikorsky's S-92. But it will have a new main rotor and transmission, upgraded GE CT7 engines and possibly a redesigned tail rotor. The basic aircraft's unit price is $15-20 million. The end product? $110 million. Sikorsky had wrapped in the U.S. flag its campaign to win the VXX competition to supply 23 aircraft for the U.S. Marine Corps' HMX-1 presidential transport squadron. It had argued that selecting the US101 would send U.S. tax dollars, national security and national pride overseas. The US101 team argued its aircraft would be built largely by Americans working for Lockheed Martin (the systems integrator), Bell Helicopter Textron (the airframe maker) and a host of subcontractors. (The main rotor will be built in Italy and the transmission in Britain.) Both teams sprinkled subcontracting work in congressional districts throughout the United States to bolster support on Capitol Hill. AgustaWestland reportedly had the backing of Tony Blair and Silvio Berlusconi, respectively the U.K. and Italian prime ministers and two key backers of President Bush's war on Iraq. But the Navy officials insisted politics played no part in their decision. "I regret to report to you the president did not call me about this helicopter," John Young, the assistant Navy secretary for research, development and acquisition, joked at the briefing. A three-layered process, he said, was intended to insulate the selection from politics. An evaluation board of about 100 technical experts forwarded its findings to an advisory committee of flag officers and senior government executives, which scored the bids and passed that data on to a source-selection authority for a final decision. Young was not that person because he is a political appointee, he said. The post was filled by Tom Laux, the Navy program executive officer responsible for oversight of the presidential helicopter. Both bids complied with the technical requirements, Young said. "Both teams could deliver this product." The question then was who could do it faster and with lower risk. The US101 team "more closely met the requirements we had laid out," and had less work "to be completed to get to the finish line and deliver a product," Young said. That meant lower costs "and less--and more manageable--risk to us." "Buy America" politicians threatened hearings into the selection. But the betting at press time was no one would meddle. "I'm a little leery of doing anything like that," said Arizona's Sen. John McCain, the No. 2 Republican on the Senate Armed Services Committee. "It's an executive decision, and the president should be able to decide this." Sikorsky said Feb. 8 it will not appeal the US101's selection. Many speculated the choice was driven not by aircraft capabilities but by which team could better integrate into the winning platform communications systems that Young said "would rival the equipment on Air Force One." Sikorksy and AgustaWestland officials dismissed that theory, saying integrated systems are worthless if the aircraft can't lift them. Laux seemed to support that. The US101's capabilities would permit addition of gear as security needs change over time, "as opposed to adding and subtracting, which is the mode that we're in right now," he said. Operations are "severely weight-limited with the existing platforms," the main one being the Sikorsky VH-3D. "The need to improve the capability and security level provided to the president is urgent," Young said. The Team US101's $1.7-billion award covers acquisition of 11 aircraft--three test aircraft, five pilot production aircraft and three low-rate production ones. The five will form Increment One, which is intended to provide an initial capability to meet that urgent need by late 2009, Young said. The Increment One US101 is to have an initial range of 250 nm, compared to the VH-3D's 100 nm. The US101 is to carry 14 passengers and four crew 26 kt. faster than the VH-3's speed of about 114 kt. The low-rate aircraft will start Increment Two which, among other things, is to extend the presidential helicopter's range to 350 nm. The Pentagon expects to spend a total of $3.6 billion on development of the new presidential helicopter, including the $1.7 billion and money previously awarded to the Lockheed Martin and Sikorsky teams for risk-reduction work. Add to that $2.5 billion for procurement of the remaining, fully modified aircraft, spares and support capabilities to bring the fleet to 23 aircraft, for a total contract value of $6.1 billion. The Bell/Agusta AB139 continued to show its popularity with an order for 20 aircraft by a subsidiary of Seacor Holdings, announced at last month's HAI Heli-Expo show. 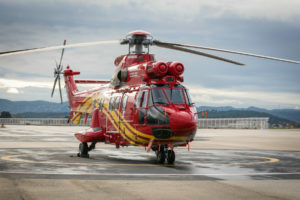 The new aircraft will be operated by Seacore subsidary Era Helicopters and initially used to support that company's operations in the Gulf of Mexico. Total value of the orders is around $200 million. Deliveries will begin this October and extend through 2009. ERA Helicopter President Charles Johnson said that while initial planning for the aircraft will be in the Gulf of Mexico, future applications "are always being considered." Johnson noted that Era Helicopters has operated in such diverse areas as off the shores of Italy, Greece, the Balkans, Argentina and Russia's Sakhalin islands. Selection of the aircraft was based on it being "a third generation aircraft, with excellent range, speed and payload" as well as having "superb Category A characteristics," he said. The Seacor order brings the total AB130 order book to more than 100 aircraft sold to over 40 companies in the two years that it has been certified, with the first five now delivered. The AB139 with a three-screen digital cockpit received Italian certification in 2003. This was followed by European EASA certification early last year and FAA Transport Category IFR certification last December with a four-screen cockpit. An official certificate handover ceremony was held at the Heli-Expo show, where the first two U.S. customers for the aircraft, Evergreen International Aviation and ChevronTexaco, received their first aircraft. Each of the U.S. companies has ordered three AB139s. The ChevronTexaco AB139 is the first delivered for off-shore work. During the ceremonial handover, Bell/Agusta Managing Director Louis Bartolotta said that the off-shore industry "represents the largest segment of the current AB139 order book." The remaining two aircraft for ChevronTexaco will be delivered later this year and next year, and will operate from company heliports at Intracoastal City and Leeville, La., according to Perry McKinney, manager of aircraft operations for ChevronTexaco. They will replace older Sikorsky S-76s. Bell Helicopter will integrate Honeywell's newest engine, the HTS900, into its single-engine 407 to create the new 407X, according to Bell CEO Mike Redenbaugh. The newest version of the 407 will allow better performance with a better fuel economy, he said. 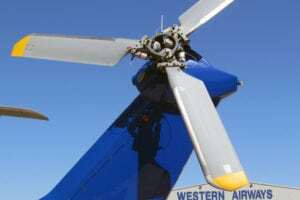 Speaking at the Heli-Expo show in Anaheim, Redenbaugh said that the 407X will have a power-to-weight ratio increase of 26 percent over the 407, with a hot day power increase of over 40 percent and a standard day power increase of about 35 percent. It also will have about a 50 percent lower direct maintenance cost per shaft horsepower over its predecessor LTS101 engine because of its ability to produce more power. The HTS900-powered 407X will have a maximum takeoff rating of 925 shp and a maximum cruise rating of 837 shp. The current 407 is powered by the Rolls-Royce 813 shp 250-C47B engine. A retrofit kit will be available to convert older 407s into the 407X. Barry Eccleston, Honeywell's vice-president, propulsion, said that he expected a growth in third-party conversion companies, such as Soloy, who will be performing the conversions. The HTS900 is a growth version of the LTS101 and designed to put Honeywell back into the civil market as a major player, Eccleston said. The HTS900 uses new compressor technology to improve its performance, according to Bob Miller, Honeywell's chief of light utility helicopter engines. The engine will be equipped with dual-channel FADEC, a next-generation impeller and cooled gas producer that provides the increased power as well as a minimum of 15,000 component cycles. Miller said the TBO is currently set at 3,000 hours, but should be raised to 5,000 in the future as the engine matures. The HTS900 will be developed in both a high speed and low speed version, with the low-speed model developed first. Low speed will be at 6137-rpm for single engine applications, while the high speed will be at 9598-rpm for twin-engine applications. Certification of the low-speed model is scheduled to be mid-2006. Miller also noted that the HTS900 is expected to grow into a family of engines, to include a future 1,000 shp-class HTS1000 and a Small Heavy Fuel Engine (SHFE) in the 1,100 shp class. 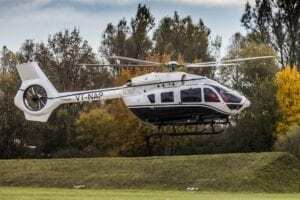 While the initial application for the HTS900 is the Bell 407X, Eccleston said that Honeywell has been in discussions with other manufacturers. Although he did not cite the manufacturers, indications were that they specifically include Eurocopter. Redenbaugh noting that the 407 will be Bell's airframe entry for the Army's ARH competition. As for whether or not the 407 line will be shut down when the 407X comes on line, "that depends on the customers' needs," he said. Redenbaugh told reporters at Heli-Expo that sales are now strong "across the board," particularly in the areas of oil and gas, EMS, construction, corporate and overseas. The company is "constantly optimistic" on homeland security orders, with some growth expected in Border Patrol and Drug Enforcement Administration orders. Noting that the basic S-76 airframe is now 25 years old, with 615 delivered around the world, Sikorsky Senior Vice President for Sales and Commercial Programs Jeff Pino announced an upgrade of the S-76C+ model to an S-76C++, with an even more advanced S-76D model scheduled for delivery in 2008. The S-76C++ will be available for delivery by the end of the year, Pino said. He told attendees at last month's Heli-Expo that upgrades to the S-76C+, which turn it into the S-76C++, will be available immediately, with retrofits available for current operators. The C++ upgrades include an improved Turbomeca Arriel 2S2 engine providing a 5- to 6 percent increase in engine ratings, a 350 to 450 lb. increase in Category A takeoff gross weight at sea level "on a hot Louisiana day," plus an improved inlet barrier filter designed to reduce sand and dust getting into the engine. It also will have a new advanced Honeywell VXP health and usage monitoring system (HUMS), as well as new soundproofing technology. The Honeywell VXP system will provide constant vibration level monitoring, as well as engine performance monitoring. It also monitors the engine drive train and "anything that rotates," according to Honeywell. Noise will be reduced though use of Sikorsky's Quiet Gearbox technology to lessen interior noise levels by 4 dBA. This will be offered as standard on the C++ and will give the aircraft "the lowest interior noise levels of any helicopter in the S-76 class," Pino said. The aircraft will also have a new VIP interior with improved soundproofing provided by Keystone's SILENCER system. Pino said the S-76C++ will form the baseline for the S-76D, which essentially will be an entirely new aircraft using the S-76 airframe. The -76D will have a new state-of-the-art cockpit avionics package and be powered by a new centerline Pratt & Whitney Canada PW210S engine designed for the aircraft. The engine will provide more shaft horsepower with better specific fuel consumption and increase the takeoff weight by nearly 1,000 lb. on a hot day while maintaining the range advantage of the S-76C+, Pino said. The PW210S engine will have dual channel, FADEC systems and produce 10 to 20 percent more power while burning less fuel than today's engines in its class, according to Keyvan Fard, PWC vice president, regional airline & turboshaft engines. The PW210S is scheduled for certification in mid-2008, he said. Combined with the new engine will be a new composite main rotor blade with advance airfoils, a composite spar and integral deicing that will allow the aircraft to fly into known icing. The new blades will allow an additional 400 lb. takeoff capability, giving the aircraft a total of 1,400 lb. increase in maximum takeoff weight. The -76D will also have a New Quiet Tail Rotor developed by Sikorsky that reduces exterior noise by 2 dBA on takeoff and a 1.5 dBA reduction on flyover, while having no change in performance handling or sideward flight capability. The S-76C++ will be offered at the same price as the -76C+, while the -76D will be offered at a price that will only have a normal increase between now and the 2008 delivery date, Pino said. In other S-76 news, Sikorsky announced at the show that CHC Helicopter Corp. has ordered five new S-76s to add to its order for 10 S-76s placed last year. The Vancouver, Canada-based company has also ordered new S-92 helicopters for its North Sea offshore fleet. Three new S-92s are scheduled to enter service later this year in Norway under contracts with Statoil and Norsk Hydro. Frank Robinson, president and CEO of Torrance, Calif.-based Robinson Helicopter Company, announced annual sales figures to a packed press room at Heli-Expo 2005. And considering the company's history of breaking industry sales figures, the audience at the Anaheim Convention Center venue was not surprised to hear that the company sold 690 units in 2004. The biggest seller in Robinson's stable of single-engine piston engines was the four-seat R44, with 456 units sold last year. The company's oldest offering, the two-place R22, saw sales top out at 234 units. Overall, the numbers translated into an increase of approximately 63 percent over Robinson's 2003 sales. "You're all going to ask if there's an R66," Robinson said with a smile. His assumption was confirmed by the scattered chuckles among the standing-room-only crowd. "Well, not yet. We have actually spent a lot of time on some preliminary designs for an R66, which will be a five-place helicopter, and that all looks good. But we're still having a little bit of a problem deciding for sure which powerplant to use." Robinson and his engineers have looked at a number of engines to use in a larger aircraft, including small turbines and a small diesel, but they have yet to find anything suitable. He was quick to add that even if the decision to go forward with an R66 were made today, it would be several years before the aircraft would be available. "You all had better stick with your Raven 2s a little bit longer," Robinson quipped. A hot topic during the Q&A was air conditioning for Robinson's flagship Raven 2. Robinson said prototypes are already being tested aboard two Raven 2s and the results are excellent. Due to weight considerations, however, there are no immediate plans to offer air conditioning in any other Robinson ships. "There really isn't a practical way to retrofit existing aircraft with air conditioning," he said, citing the weight of the 30+ lb. system. Air conditioning should be available on Raven 2s in about a year and should sell for $18,000 as an additional option. Meanwhile, Robinson engineers are examining glass cockpits, GPS units and rudimentary autopilot systems as options for future aircraft. Although orders for civil turboshaft engines will be essentially flat for the near future, major military rotorcraft programs will hit their stride and lead to an upturn in the turboshaft engine market later in the 2005-2014 time period, according to a new Forecast International study: "The Market for Aviation Turboshaft Engines." a substantial market could come from re-engining current programs, including the U.S. Marine Corps UH-1Y/AH-1Z and CH-53 programs, and the U.S. Army's AH-64s and UH-60s, although those programs could be subject to budgetary cuts. The forecast projected a total of 21,544 turboshaft engines needed during the 10-year time frame, with a total market value of $11.26 billion. Military sales will account for 11,676 engines worth $7.68 billion. Over half of the engines will be in the 1,200-2,500 shp range, with more than 40 percent of those being the General Electric T700/CT7 series. The U.S. Army could be the biggest customer, requiring T700-GE-701D upgrades for more than 1,000 UH-60 Black Hawks. Forecast International said that the T700/CT7 program alone will make GE the largest player in terms of revenue at $3.24 billion, or 28.8 percent of total market value. However, Turbomeca will be the market leader in terms of units manufactured, with 5,209 engines compared to GE's 4,785. Northrop Grumman has completed the first phase of testing of the Hunter II demonstrator, the newest member of its unmanned aerial vehicle (UAV) family. Hunter II will be a twin-boomed, medium altitude larger version of the Hunter UAV already in use with the U.S. Army. The flight testing was conducted at Cochise College Air Field in Douglas, Ariz., designed to demonstrate the new UAV's endurance, communications and air-to-ground surveillance capabilities, according to Rick Crooks, Northrop Grumman's manager of business development for tactical UAV systems. Crooks said that the Hunter II will offer extended range and endurance over the "combat-proven Hunter system" that has already gained a reputation for reliability and durability, and will feature "a software architecture that can easily accommodate new payloads and data handling requirements; state-of-the-art avionics and a weapons capability and communications subsystem that will allow it to share data seamlessly with current battlefield networks." He added that Hunter II will complement the company's current high-altitude, long-endurance RQ-4 Global Hawk aerial reconnaissance system, the shorter-range, lower-altitude RQ-5A Hunter tactical UAV and the Fire Scout vertical take-off and landing tactical UAV. Additional flight testing is planned through the first quarter 2005. The U.S. Border Patrol has entered the evaluation phase of UAV operations follow a seven-month demonstration testing of UAVs along the Arizona-Mexico border. The testing is part of a $29 million Arizona Border Patrol Initiative that added 200 full-time and 110 temporary agents to the Border Patrol's Tucson sector, as well as boosting its aviation assets to 15 helicopters and one fixed-wing aircraft. The results of the tests are being evaluated for use by the Department of Homeland Security. The testing of the UAVs began last June 21 using the Isreali Elbit Systems' Hermes 450. Hermes testing ended Sept. 30, followed by testing of the Northrop Grumman Hunter UAV from Oct. 10 through Jan. 31. Andy Adame, spokesman for the Tucson Sector Border Patrol, said that testing of the UAVs was not specifically to determine their overall enforcement capabilities, but also to determine their feasibility in regard to overall costs plus their effectiveness during inclement weather conditions, ranging from high winds to severe dust and rain storms. The overall concensus is that the Border Patrol is "very happy" with the results and feels that UAVs can be used for the patrol of U.S. borders, he said. The testing was done along the 261 mile stretch of border between Mexico and Arizona, with the UAVs flying on a daily basis. Deccan Aviation Ltd, one of India's leading helicopter charter firms, has set up a maintenance and overhauling facility in Karnataka to service Bell helicopters. Deccan Technical Services of Deccan Aviation will operate the Bell customer service facility at Jakkur aerodrome under certification of Bell Helicopter Textron and the Indian Director General of Civil Aviation. It is the second such facility in India, the other being in Mumbai set up by Air Works. The Rs.15-million ($343,000) new facility will maintain airframes and gear boxes, as well as carry out component overhaul of Bell 206 and 407 helicopters operating in India and other South Asian countries. Bell has to date sold about 50 helicopters in South Asia since its entry into the area a decade ago. Currently, there are about 100-120 civilian helicopters operating across the country, mostly used by corporations, private airlines, public sector enterprises and government organizations. Deccan Aviation currently operates nine helicopters in a mix of Bell and Eurocopter models. Eurocopter is the other leading helicopter manufacturer vying with Bell in the subcontinent, where the market for civilian helicopters has picked up following the open sky policy. Deccan Aviation Chief Executive G.R. Gopinath, who pioneered India's first low-cost no frills airliner Air Deccan, said that in addition to Bell component overhaul tasks, the Deccan Technical Service facility would carry out maintenance and overhaul of wheels and brakes of turboprop ATR 42 series and Airbus A320 aircraft. "This facility is an enhancement of Bell's earlier approval for carrying out field maintenance of its copters operating in South Asia, especially India," he said. Max Wiley, Bell vice-president---Asia-Pacific, said, "With the civil aviation sector emerging as one of the drivers of the Indian economy, we see a huge potential for marketing our helicopters to public and private organizations. In related news, Wiley said that Bell wants to sell 100 of its 407-model helicopters to the Indian military. "We have put in bids which are being evaluated by the Indian army," he said. "If it goes through, then 60 of these will be direct sales and the remaining will be produced under license at Hindustan Aeronautics Limited, The deal requires part production in India." Wiley said India-produced units, costing $2 million each, could also be exported. 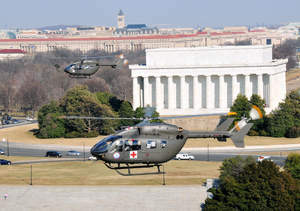 More than 600 Bell 407 single-engine helicopters used by law enforcement, corporations and militaries have been deployed all over the world, he said. Bell Helicopter also announced a tie-up with low-cost airline Deccan Aviation for component overhaul of Bell Helicopters at the Indian firm's facility at Bangalore. So far, 13 helicopters have been sold by Bell in India, mostly to private firms. "Another two will be sold soon to Reliance group and Pawan Hans Helicopter, a charter firm," Wiley said. The challenges facing the White House in the areas of defense budgets vs. military hardware will be the subject of a new study by Newtown, Conn.-based Forecast International. The study, "Force Transformation and the Second Bush Administration--Concept Versus Realities," will analyze the programs and trends that will impact on the defense industry in the years ahead. Major to the analysis will be a forecast of future defense budgets and the effect of a growing deficit, to include the impact of the high cost of the Iraqi war on procurement of future military systems. "The forthcoming series of DOD Defense Reviews will strive to achieve the correct mix of weapons while shaking off the remaining vestiges of the old Cold War thinking," Forecast International CEO Ed Nebinger said. "Ideally, this should result in a major transition, not only in high-tech weaponry but in the size, composition and deployment of the active forces, as well as the structure of the Reserves and National Guard. The formidable task that our company has undertaken is to cut through the rhetoric of what military planners and some Congressional spokesmen believe we need and present a realistic projection of the end result in view of the political and economic realities. In short, it will address the question--What level of national defense is affordable yet capable of meeting the challenges of the years ahead?" The new study will include a five-year budget forecast for each of the Defense Department's top 25 procurement and RTD&E programs. However, its central core will be an examination of how U.S. military forces will progress in the geo-political landscape of 2010-2015 to meet continually evolving threats, Nebinger said. In looking at the nation's military needs, the analysis will study the primary threats to U.S. security, to include "The Buffy Paradigm" (or unconventional warfare), hostile nation states, non-nation state players and weapons of mass destruction. The study is scheduled for release this spring. The U.S. Navy could save upwards to $500 million in aircraft acquisition costs plus more than $27 million per year through the use of commercial operators for search and rescue work at 14 land-based Naval facilities, according to a study conducted by the Center for Naval Analyses (CNA) and reported in "Defense Daily," a sister publication to "Rotor and Wing." The study showed that the Navy operates 43 SAR helicopters at the 14 locations at a cost of $2.3 million to $5 million per detachment per year. However, two of the detachments are not dedicated SAR operations and the remaining 12 have averaged less than one Naval SAR mission per year. Two of the detachments haven't conducted a Navy SAR mission since 1993 and in all of 1997 only one downed flyer was rescued by a land-based Navy SAR helicopter. The study noted that two types of helicopters are used at the land-based SAR stations: 18 HH-1Ns, primarily used for missions over land, and 25 UH-3H mainly used for missions over water. Both types are over 25 years old and scheduled for replacement in the next few years. If the Navy stays with its current program of land-based SAR detachments, the most likely scenario would be to replace both types with either new UH-60s at a cost of approximately $20 million per aircraft, or with HH-60Hs transferred from active and reserve units. Based on the average cost of maintaining Naval SAR helicopters versus the average cost of performing an SAR mission, the study showed that the per-mission cost is actually higher than the average annual cost of an SAR unit. From 1990 through the first half of 1998, the total cost for operations, personnel and maintenance for the 12 detachments was $386 million, or an average of $3.7 million per detachment per year. However, during that period, the detachments responded to just 87 Navy calls for an SAR operation at an average cost of $4.4 million per mission. As a result, the CNA recommends that an alternative in many cases is to contract with commercial operators using a combination of retainer fees and fees per flight hour. It noted that each of the 14 stations is different, so that the recommendations for change vary from station to station. In some cases, the SAR role could be turned over to the U.S. Coast Guard. As an example, at NAS Patuxent River, CNA suggested encouraging the Coast Guard to increase its presence in the Chesapeake Bay area, which is the source of most of the Pax River non-Navy SAR calls. If that is not feasible, the Navy should contract with a commercial operator to meet the station's alert requirements. Outsourcing the SAR requirements would be about $1.9 million per year, for an annual savings of more than $3 million. At NAS Key West, the unit's three UH-3Hs average about one Navy SAR mission per year, but respond to more than 15 civilian SAR missions per year. However, about 85 percent of the SAR mission efforts is the responsibility of the Coast Guard, the study said. If the Coast Guard cannot be convinced to expand its coverage, then a commercial provider should be used. Transport Canada has issued a supplemental type certificate for an Inlet Barrier Filter system produced by Aerospace Filtration Systems, Inc. (AFS) for Bell 206L-3 and L-4 helicopters. A U.S. STC was issued in August, 2004. The certification clears the way for production Bell 206L-4s to fly away from the factory with the AFS system installed. 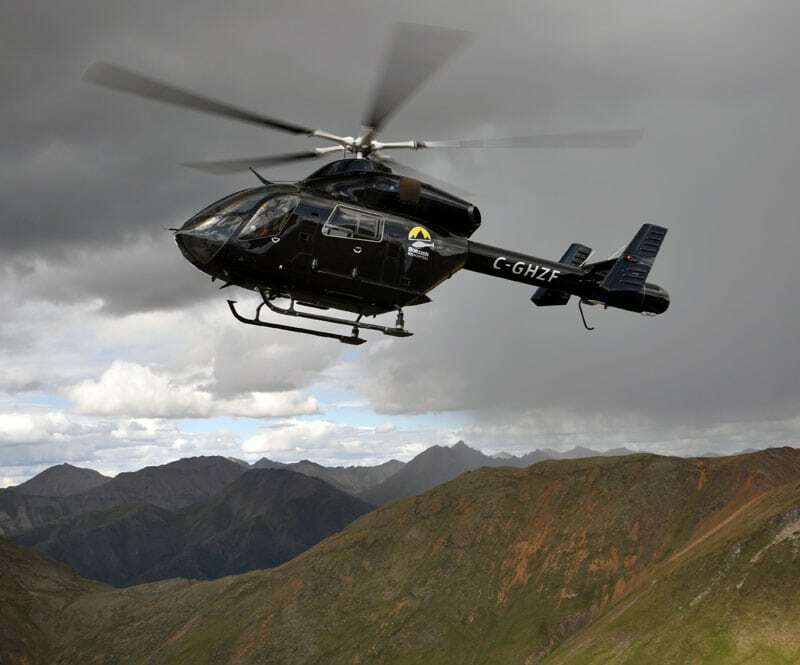 The system also is available to existing Canadian commercial operators of Bell 407s, 206L-3s and L-4s. The AFS system includes a single filter design optimized for hover and forward-flight conditions. A standard access door allows the filter to be removed and replaced quickly and easily, the company said. The system filters out more than 99 percent of dust and sand, enhancing engine performance when compared to an inlet particle separator and providing a greater margin of safety where and when it is needed, according to AFS officials. The company said it has delivered more than 1,000 systems and over 6,000 filters to military and commercial customers worldwide, with AFS filtration systems now in use on U.S. Army OH-58D and AH/MH-6J helicopters flying in Iraq, accumulating over 300,000 erosion-free flight hours. AFS commercial products for Bell model 407, 206L-3 and 206L-4 helicopters are distributed exclusively by Aeronautical Accessories, Inc. (AAI). In a related development, U.S. regulators approved British defense company QinetiQ's $130-million purchase of the Westar Aerospace & Defense Group, the parent of AFS. The U.S. Committee on Foreign Investment cleared the sale of the Westar group to QinetiQ. The committee is headed by the Department of the Treasury and includes members from the departments of Defense, Homeland Security and State. Westar provides engineering, software and logistics services to the Defense Dept., primarily in aviation and ballistic missile defense. Total Air Management Services (TAMS) of Sheffield Airport, England, has placed the first Schweizer 333 on the U.K. register. G-TAME is the first 333 to be given a "G" registration and the first of five 333 helicopters sold to TAMS by Caseright Limited (Schweizer Distributor) based at Turweston Airfield, Brackley, Northants, England. The Aircraft will be used for pipeline inspection. Steve Angel-Jones, Schweizer Helicopter Sales for the U.K., said that the large cabin area provides an unobstructed view of the operation and will alleviate having crew in a back seat. Gulf Helicopters has signed up as the first helicopter customer for Emirates-CAE's new Flight Training Center in Dubai. The Bell-associated training facility offers Bell 212/412 training to Middle East-based operators. Emirates-CAE Flight Training is a joint venture of Emirates Airlines and CAE. Bell Helicopter will begin sending flight students to the facility as soon as the center's 412 full-flight simulator gains approval by the U.S. FAA and the European Joint Airworthiness Authorities. The simulator is slated for installation at the facility by the end of this year. In addition to the expected Bell 412 helicopter simulator, the 14-bay centre houses full-flight simulators for an Airbus A319/ACJ/A320/A321, an A330/340, a Boeing 737 NG/BBJ and a Hawker 800/800XP simulator, as well as a Gulfstream IV and V. Another Boeing 737 BBJ/NG simulator will be added in 2005. Mohamed Al Mohannadi, Gulf Helicopters general manager, said that they will train under a five-year exclusive agreement that begins as soon as the full-flight simulator enters into service at the end of 2005. Training currently is conducted in Europe, he said. Gulf Helicopters, based in Doha, Qatar, has an all Bell fleet of 24 helicopters consisting of 15 412s, two 206s, six 212s and a single 230. However, the growth of the oil and gas industry, along with increasing its marketing efforts in Europe and Africa, could allow the company to double its fleet to 40 to 50 aircraft, Al Mohannadi said. "The addition of a state-of-the-art Bell 412 flight simulator in Dubai is the first of a number of initiatives we expect to be announced in the coming months," said Paul Giles, senior vice-president, helicopter group of Hawker Pacific, the Bell Helicopter regional independent representative. These initiatives "will see locally-based world-class support for the Bell Helicopter range of products being provided to our regional customers." The U.S. Marine Corps is awaiting budget approval to shift production of its new UH-1Y Hueys from 100 re-built UH-1Ns to a mixed batch of roughly 10 re-builds and 90 new builds. The money for the new builds is in the budget, according to USMC sources, although the supplimental strategy budget has yet to be signed. The new build program would start with Batch Three, with the first two batches producing about 10 re-built Hueys, according to Bell President Mike Redenbaugh. Speaking at last month's HAI Heli-Expo show, Redenbaugh said that Bell was ready to begin production of the new larger Hueys as soon the budget is signed off and approval given. Production will be at Bell's Amarillo, Texas facility, he said. The Amarillo facility is also the production and/or assembly site for the AB139 and BA106. Initially, all 100 UH-1Ys were to be rebuilt from older UH-1Ns. However, the need to keep the older Hueys in the fleet caused the Marine Corps to re-evaluate production plans for the aircraft. The UH-1Y/AH-1Z upgrade program passed the 2,500 flight hour mark during the closing phase of its system development and demonstration phase, according to Maj. Dave Thompson, H-1 program engineering and manufacturing development IPT military lead. The program goes into the final operational evaluation phase this summer. The aircraft have already gone through operational assessment by Fleet pilots and crew, proving their expanded capability "to fight in extreme conditions like snow, cold and hot weather, high altitude, dust and desert" and are now on track "for a successful OpEval this summer and beginning of full-rate production," Thompson said. Both the AH-1Z and UH-1Y have concluded weapon testing in Arizona. Sikorsky Aircraft Corp. has delivered two S-70 Black Hawks to the Royal Thai Army, giving the army five Black Hawks, all of which were acquired through the U.S. Foreign Military Sales program. Sikorsky had previously delivered six S-70B Seahawks for shipborne service and six S-76s for search-and-rescue to the Royal Thai Navy via that program. Worldwide, S-70 Black Hawk variants are serving, or are on order, with 25 governments--Argentina, Australia, Austria, Bahrain, Brazil, Brunei, Chile, Colombia, Egypt, Greece, Hong Kong, Israel, Japan, Jordan, Malaysia, Mexico, Morocco, People's Republic of China, the Philippines, Republic of Korea, Saudi Arabia, Spain, Taiwan, Thailand and Turkey. Frank Jensen, former president of HAI, passed away on February 12. He joined the HAI in 1982 and served as president until 1998. During that period, he was named Elder Statesman of Aviation by the National Aeronautics Association and designated a Fellow of the American Helicopter Society. Frank joined the U.S. Navy in 1943 at the age of 15 and served as a combat radioman/gunner on dive bombers and patrol bombers. After World War II, he joined the U.S. Army, became an officer through OCS, went through airborne training and served as a paratrooper with the 187th Airborne Regimental Combat Team during the Korean War, earning numerous decorations. He then went to flight school and served two tours of duty in Vietnam. He retired from the Army as a Colonel and Master Aviator. He received a Master's Degree in Aerospace Operations Management from the University of Southern California and earned his FAA certificates as a commercial pilot, fixed and rotary-wing, single and multi-engine aircraft. From 1976 until 1981 Frank served as Chairman and CEO of the Radio Technical Commission for Aeronautics. He also served as President of the Washington, D.C. Chapter of the Army Aviation Association of America, President of the Aero Club of Washington, Secretary of the Helicopter Foundation International and Executive Director of the Tour Operators Program of Safety. Turbomeca USA has appointed Larry R. Alexandre to the position of Chief Operating Officer, based at its Grand Prairie, Texas facility. Asa Hutchinson, Undersecretary for Border and Transportation Security at the Department of Homeland Security (DHS), which includes DHS jurisdiction for aviation, announced his resignation effective March 1. Dr. Michael Romanowski, assistant vice president of civil aviation for the Aerospace Industries Association, has taken over the position of vice president of civil aviation. He replaces Bob Robeson who has moved to the FAA as manager of the FAA's Systems and Policy Analysis Division. Keystone Helicopter has appointed two new vice presidents within its organization. Jim Munda has been named vice president of engineering. Darrell Jones is now vice president of completions. The General Aviation Manufacturers Assn. has hired Gregory J. Bowles as manager of engineering maintenance. He previously had worked at Keystone Helicopter. Air Logisitics, LLC has named Gary Tucker to be general manager of Air Logistics of Alaska. Air Logistics International has hired Blake Dupuis to be director of the South American Strategic Business Unit. March 22-24--Navy League, Marriott Wardman Park Hotel, Washington, D.C. Contact: Megan Cheek, 703-528-1775; www.navyleague.org; e-mail: mcheek@navyleague.org. March 31-April 1--LABACE2005, Sao Paulo, Brazil. Contact 202-783-9000; e-mail: info-us@labace.aero; website: www.labace.aero. May 5-11--Army Aviation Association of America (Quad-A) Annual Convention, Disney Springs Coronado Resort, Orlando, Fla. Contact: Bob Lachowski, Monroe, Conn. 203-268-2450; fax: 203-268-5870; website: www.quad-a.org; e-mail: aaaa@quad-a.org. June 12-14--46th International Paris Air Show (2005), Le Bourget Airport, France. Contact Salons Internationaux de l'Aeronautique et de l'Espace, Paris, France, +33-(1)-53-23-33-33; fax +33-(1) 47-20-00-86; web www.paris-air-show.com; e-mail info@hfusa.com or siae@salon-du-bourget.fr.